The Creekside Chalet borders the National Forest and offers private and spacious ski accommodations for larger families and groups with extremely close access to the Thunderhead high-speed lift. Walk into Creekside Chalet and you will be drawn to the open spaces and common areas of this cozy chalet. The expansive Great Room with cathedral ceiling offers spectacular views of the mountains. Step out on the sunny south-facing deck for a view down the valley. This room offers plenty of room for all to lounge in. The over-stuffed leather furniture invites you to relax with your feet up! The spacious kitchen is fully equipped with professional grade gas stovetop and griddle, double ovens and double Bosch dishwashers. Aspiring chefs in your group can tantalize your taste buds with the delights of their efforts that will energize you for a day on the mountain. Children can enjoy meals at their own pace in the breakfast nook with seating for 8 while adults will enjoy relaxed meals in the spacious 10-person dining area in the Great Room. Creekside Chalet offers 6 spacious bedrooms each with en-suite bathroom and flat panel TVs with DVD players. This home is a perfect fit for a variety of groups as in addition to the master, which has a King bed, a bedroom has a King or the option of two Twin beds, four have Queen beds, and the Rec. Room has a Twin over Full bunk bed. The master bedroom and bathroom includes a gas fireplace, steam shower, and large bathtub to soak away the day. On the lower level of the chalet is a large recreation room with/ Wii video games system, home theater 60in LED Smart TV with surround sound and a full stock of books and board games for the whole family. Movie lovers can dim the lights and turn up the sound or children can play without disturbing the rest of the chalet. On a side deck looking up to the ski mountain is an 8-person private hot tub. Soak, unwind and plan adventures for the day ahead under a starlit sky or while fresh "Champagne Powder” coats the mountain. Ski access is a breeze at Creekside Chalet as private shuttle service will bring you to the Thunderhead Express Chairlift in just one minute. Professionally managed by Moving Mountains. We specialize in creating memorable vacations in exceptional mountain homes. We continue to work with an expanding portfolio of luxury properties and will take care of every last detail of your stay. It is set up to meet your every need. The location is private but convenient for the skiing at the same time. Free High-speed wireless internet, Digital Cable TV, CD, Hot Tub, Jacuzzi, Gas BBQ, All Rooms with full private en suite bathroom. Flat panel TV/DVD players throughout. Nothing disappointing to report after enjoying this home for a week. The home is beautiful, spacious, well supplied and well kept. There are special amenities and well thought out details. We had a total of 12 adults (4 couples) and a 14 mo. old and had plenty of room. Moving Mountain's service was outstanding and we took advantage of their shuttle to the nearby lift. 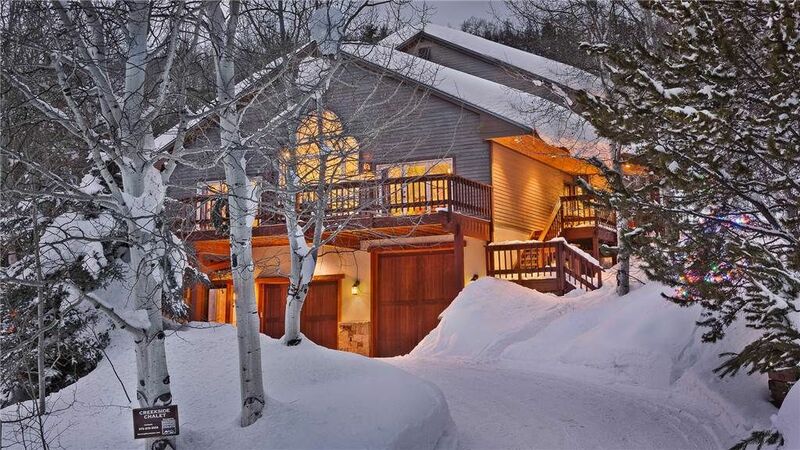 I enjoyed a quick trip with friends to Steamboat Springs in early March, staying at this Moving Mountains Chalet. It was quite possibly the best vacation I've ever enjoyed, even for such a short trip. The house, service, and amenities were wonderful - the hot tub, giant kitchen, bedrooms, private bathrooms, game room, TVs galore, the list goes on. Having access to the Moving Mountains shuttle was also great - the service was fast and everyone who works for the company is so accommodating and helpful. Last, but certainly not least, enjoying one of Moving Mountains' catered meals in the house, with a chef cooking for us while we drank wine in the hot tub was phenomenal. Who doesn't want that type of luxury while on vacation? Our trip outside of the facilities was also wonderful - night skiing, snowboarding, ice climbing, a delicious meal at Laundry, and a trip to Strawberry Park Hot Springs all made the list! A flawless family trip in a beautiful home on the mountain. Thanks Moving Mountains for answering our every need and helping us find this great home. Shuttle made ski access a simple phone call. We also loved that we could bring our dog. Thank you for this wonderful review. It's a pleasure get feedback like this and we look forward to the possibility of a return stay in the near future where will again move-mountains for you and your family! Wonderful home - great location. Going back!! We have skied Steamboat for many years and were delighted to find Moving Mountains for our March trip last year. We loved the Creekside Chalet - perfect for our family with lots of extra touches like board games or movies, and a properly equipped kitchen, that really made it feel like home. The home was beautifully clean, well maintained and the shuttle service from the door made ski access a breeze. for shorter stays of 3 or 4 nights respectively where shorter stays are permitted. subject to reduced taxes and fees.